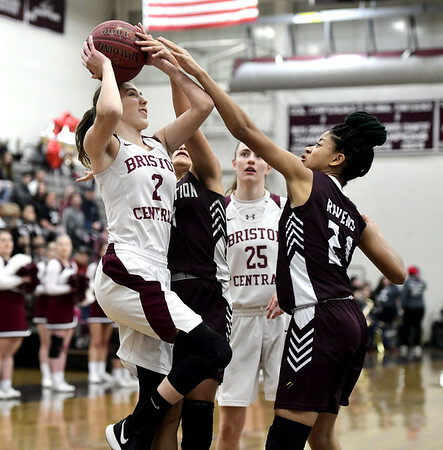 BRISTOL - The seniors for the Bristol Central girls basketball team were honored before Thursday night’s game against Innovation, with the four future graduates acknowledged for the impact they left on the program over the course of the past four years. Once the contest tipped off, the Rams’ four seniors made sure to leave an impact on the game as well. Central’s four seniors combined to score 16 of the team’s first 17 points to build a first quarter lead and guide the Rams to a 51-14 win on their home floor. All four seniors recorded at least two points in the opening 10 minutes to pace Central’s offense, while a dominant second half that saw 10 forced turnovers in a four-minute span left no doubt of the outcome. Central’s tough defensive stand in the second half led to a 31-0 run, holding Innovation scoreless through the entire second half. Ashley Watson led the seniors, and the team, with 15 points while dominating at the rim in the second half. The Ravens were dealt a tough blow when Ariana Rivas was hurt on a 3-point attempt just over two minutes into the second quarter. Gaines had just set the team record for points in a single game with 21 against Civic on Wednesday, but did not return after the injury and finished the night scoreless. Innovation was starved for scoring without Gaines, but the Rams were laboring as well early on. Bailieu missed three breakaway layups on three straight possessions midway through the second quarter, which began a stretch of seven straight shots missed in the paint by Central, allowing the Ravens to cut a 10-point deficit to six at the half. Innovation could have drawn even closer before the break, but missed five of its seven free throw attempts in the second quarter, as its offense slowly disappeared without Rivas. “We missed a lot of layups in the first half. That game was a lot closer than it should have been in the first half, but how they turned it around was a testament to them and these seniors,” Central coach Steve Gaudet said. Freshman Ella Watson began the second half by draining Central’s first 3-pointer of the game to put the Rams back ahead by nine, then scored minutes later off the Ravens’ fifth turnover of the quarter to give Central its largest lead of the game at 11. Innovation coughed up nine turnovers in the quarter’s first four minutes, while Central went on its torrid stretch that made for a satisfying farewell for the seniors. Bristol Central senior Allison Jessie finished with six points and a hug from her father, Innovation coach Michael Jessie on the sideline before checking out one final time. Three-point goals: Te’ijah Roberts (I) 2, Ella Watson (BC) 1. Records: Innovation 6-12, Bristol Central 4-15. Posted in New Britain Herald, Innovation on Friday, 8 February 2019 21:48. Updated: Friday, 8 February 2019 21:50.